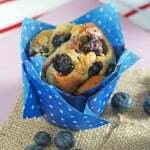 Delicious and super healthy, these gluten free Oat & Blueberry Blender Muffins are so easy to make and nutritious enough to have for breakfast! I promised myself that I was going to get better at breakfast time in 2016. Although I always have great intentions to encourage the kids to eat a wider and more varied diet at breakfast time, I still find myself falling back on the same breakfasts when we are in a rush during the week. I have seen Blender Muffin recipes all over pinterest lately. 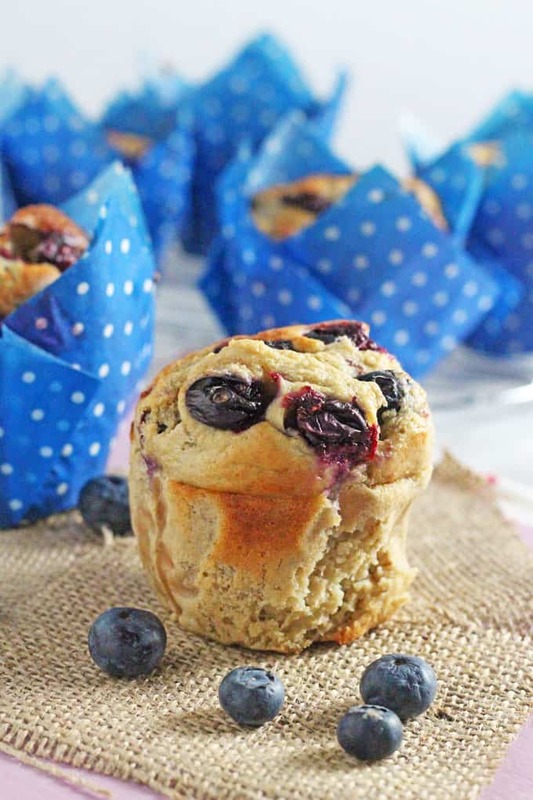 This recipe in particular caught my eye and I decided to adapt it to make these super delicious and healthy Oat & Blueberry Blender Muffins. Perfect for busy mornings when I don’t have enough time to prepare a breakfast from scratch. First of all I have to stress how easy this recipe is. All you need to do is chuck the ingredients into a blender or food processor and blitz until they are all combined. No hard graft needed in mixing or stirring! 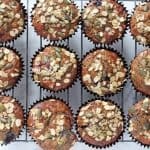 These muffins are super nutritious too; made with oats rather than wheat flour and honey instead of refined sugar. They are perfect for breakfast, packed full of slow releasing carbs and fibre and make a great snack for kids too. One thing I should point out is that because these muffins are made with oats, they are denser than normal muffins. So if you are expecting a super light and fluffy muffin then I don’t want to disappoint you. However, I really like the texture of these muffins and even though they are quite dense, they feel really hearty and filling. My daughter gets really excited when I serve these for breakfast now. She calls them “Breakfast Cake”, so I’m taking that as a big thumbs up from her! Preheat the oven to 390f / 180c. Line a muffin tray with muffin cases and spray them with a little spray oil. Put all the ingredients except the blueberries into a blender or food processor and blitz until all combined. Stir in half the blueberries. Pour the mixture into the muffin cases, filling 3/4 full. Top with the remaining blueberries. Bake in the oven for between 15 – 20 minutes or until a toothpick comes out clean. 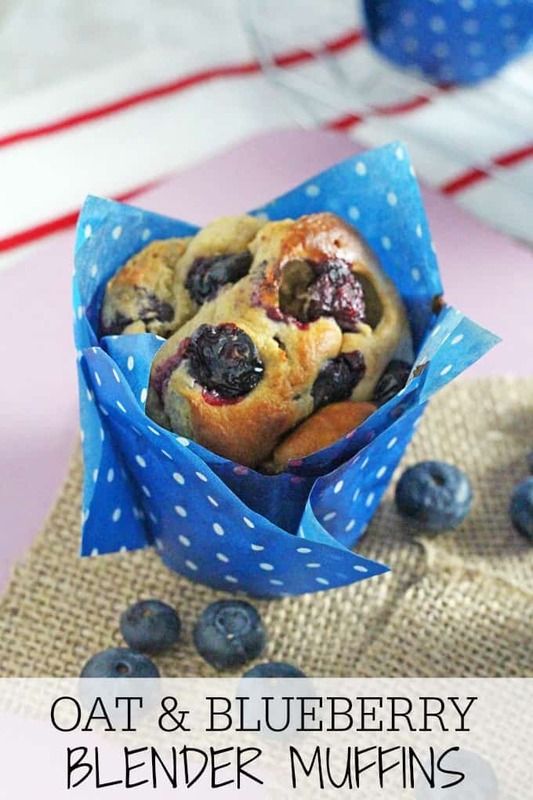 Remove from the muffin tins and allow to cool on a wire rack. 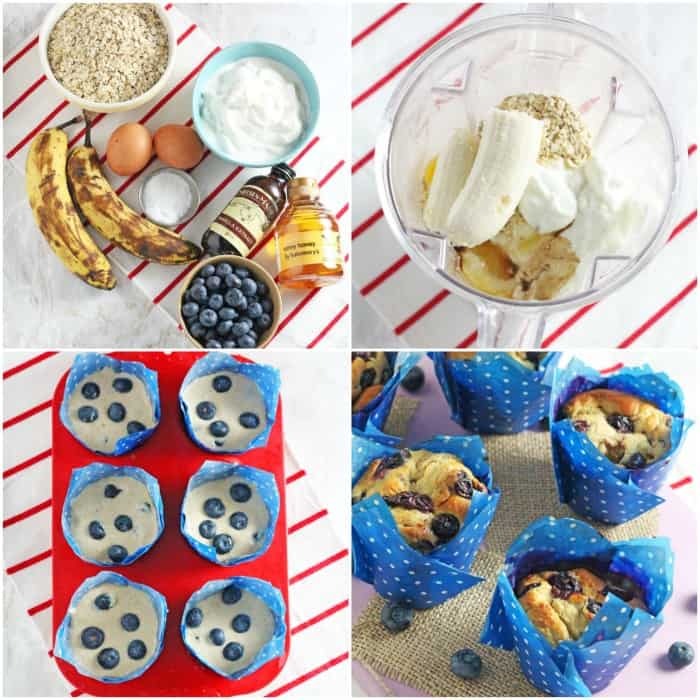 This recipes makes 8 large or 12 small muffins. * Disclosure: This is an affiliate link. If you buy a blender through this link I will earn a small commission from the sale. However, this does not effect my recommendation of the product as I will only recommend products and services that I myself use and like. I used my nutribullet to make these and they tasted great! The flavor was ok but they didn’t set up and they were very mushy. Simple, healthy and tasty ! Me and my daughter just made these and they smell delicious but have completely sunk in the middle when I’ve taken them out of the oven. I’ve also had to cook them for three times longer for the tooth pick to come out clean. I used the same cup to measure everything. Is that incorrect then based on the comments? Was so looking forward to eating them and they look like blueberry pancakes lol. 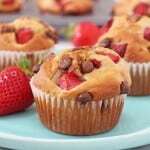 Hi Esther, I think a lot of people are having issues with these muffins so I am going to redo the recipe. Is this meant to be 2 cups of oats? Hi these are lovely I have made them recently do u have a list of nutrients for them calories carbs/protein? I want to freeze the rest of the batch, do you just put them in a big tupper wear? or wrap each one seperatly in cling film? also how do they do with heating if you want to eat them warm? To freeze I put 4 of them into a freezer bag and then squeeze out the air and seal shut. I tend to just leave them out overnight to defrost but you could microwave them too. Although they might start to fall apart so be careful! These look delish! How many grams in a cup of yogurt?? I never measure anything with cups! Hi. I don’t measure w/grams but per google, it’s 220 g for 1 cup. Hi. I made a double batch. I used 1/2 cup applesauce and 2 eggs instead of 4. I also used 1 cup fresh black cherries and 1 cup fresh blueberries. In half of the mix I added dark chocolate chips. I declare they are DELICIOUS! 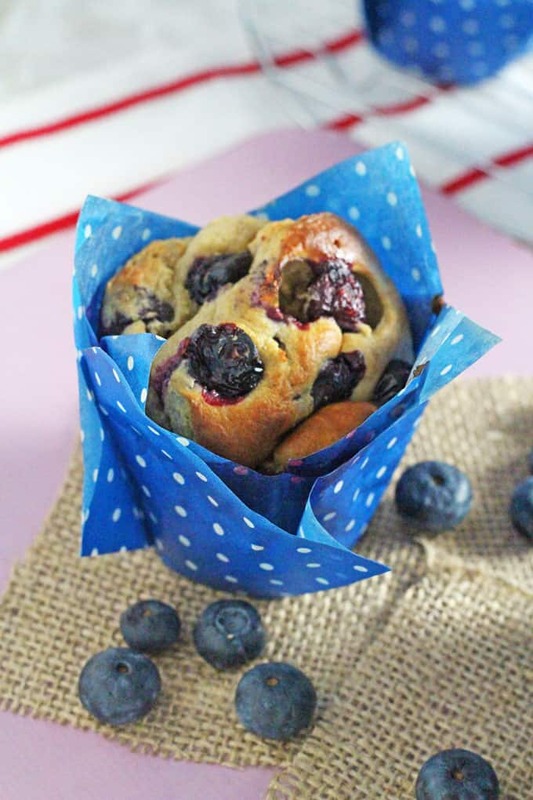 Oh my goodness the cherries and blueberries – oh my! And then the ones with chocolate are just so decadent. My problems with it were #1 it sticks to the muffin papers. Next time I won’t use muffin liners. #2 it took forever to bake – 30 minutes on 350 & then 10 at 250. Maybe I’ll try baking at a higher temperature next time. Use parchment paper liners or just cut parchment paper cut to size and they won’t stick. These are delicious! I added about 1/4 cup of flax seed meal and they are so moist! Delicious! I love flaxseed so will have to try adding it to this recipe! Hi! I have a question for you regarding the yogurt in the recipe. My sister is allergic to dairy so I have to replace dairy products. Do you know of anything I could replace it with? Could I use any sort of oils or dairy-free milk? Thank you! Hi Gabby, you could try dairy free yogurt – so coconut yogurt or soya yogurt. Hello. Do u use plain Greek yogurt? Could u use vanilla flavored? I ran out of plain but have vanilla. Hi Lisa, yes you could definitely use vanilla. Maybe leave out the vanilla extract if you do! Not sure what I am doing wrong but I have tried these twice and they don’t cook in the middle however brown on top. After 20 mins when I check on them they just go flat. How much yogurt is a cup? Do you have to sift the baking powder etc. I was really looking forward to eating them with my toddler for snack ???? Hi Rachel, I’m sorry they didn’t work out for you. Sometimes different ovens can vary very differently. Perhaps try putting less mixture in each muffin tin and turning the temperature up a little. That should help them to cook through. Hi, I just tried these, and though they taste delicious, mine did not cook in the middle. I realised that as I tried to convert the cup measurements, I inadvertently used an equal proportion of yogurt to oats. Doh! Do you mind measuring how many grams your cup give? They seem to vary wildly across the Atlantic! Yes you can freeze them! Then just take them out and let them defrost naturally want you want to eat them again! My son is 10 1/2 months old so we still can’t do honey, do you have a substitute that I can use? Hi Candi, try just a small amount of apple sauce. That should be ok! Have just made these, taste delicious but a big stodgy st the bottom sadly 🙁 I’ll still eat them but may need to reduce temperate for fan assisted oven and cooked a little longer as tops browned quite quickly! Hi, oats can be a bit difficult in baking sometimes, but im glad you found a solution to get them even cooked! These look gorgeous, and healthy too! I might have to try these out with my little one, he was just asking if we could do some baking. I didn’t even know you could make muffins in a blender! What a great idea – these look delicious Ciara! Thanks Kerry, they’re super simple! They look great, 2 cups of what kind of oats? Cooked, raw, quick, rolled or oat flour?